Now Offering ALL-YOU-CAN-EAT SUSHI at FIRST & HERNDON! Now you can enjoy an unmatched variety of Sushi, Sashimi, Rolls, and so much more with our NEW All-You-Can-Eat Sushi, in addition to our a-la-carte menu. (NOTE: All-You-Can-Eat and a-la-carte tables must sit separately. No substitutions allowed. Additional charge for leftovers. Click to see rules). 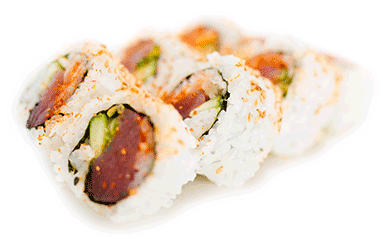 Since our beginning, Sashimi Express has been dynamic. We’ve looked to the future while maintaining our core values – with quality ingredients our chefs will use their heart, technique, and meticulous preparation to wow you. Want fast service? That’s our specialty! Need even faster service? Order online or call ahead! Our fast casual concept allows us to delivery your food quickly but at the same time your food is always made to order. Find your favorite rolls easily on our jam-packed menu, mix and match and create your own style. We have 10 unique party trays for catering and beer, beer, beer (Herndon location). So come on in and enjoy our fun decor where friendly staff will always appreciate you. We’re dedicated to using the highest quality ingredients. Our food is balanced, flavorful, consistent, and simple.